This is a guest post by Dr. Jennifer Feng, a third-year Family Medicine resident working with CCMU as an elective through the University of Colorado. 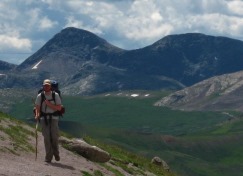 When I first moved to Colorado, one of my goals was to climb a 14er. I joined a group of friends, and we decided to camp and hike Mt. Huron. Looking up from the trailhead, I began to question my decision—that summit was really far away. The excitement I felt getting started quickly faded and frustration set in as each time we crested a hill, and I was so sure it meant we were almost there, I was faced with another taller, steeper climb. In the same way, but more intensely, achieving good health can feel overwhelming. You may want to eat healthier meals, but that means you need to have access to affordable, healthy food—which many food deserts do not have. You may have to drive a long distance or pay a whole lot to purchase your fresh ingredients. Then, you need to have the time to cook your healthy meal and keep this routine up on a regular basis. Or, perhaps you want to quit smoking, which has its own series of obstacles to overcome and potentially enormous life changes that have to be made. For patients facing multiple chronic conditions, taking several medications, and making frequent doctor visits, or those impacted by social factors like poverty or a lack of insurance, good health might feel out of reach. Although we know many patients successfully navigate the health system and manage their health, despite significant obstacles, I can also understand why someone might feel overwhelmed, when the task appears too daunting to begin. However, in order to improve our health as a state, we need all individuals engaged in improving their own health and the health of their communities. As I complete my residency as a Family Medicine doctor, I’m constantly looking for ways to help my patients achieve good health. When I’m in a clinic, I use tools like motivational interviewing and self-management support to empower patients one-on-one. At CCMU, I’m spending a month developing ways community organizations can engage residents and patients in improving and advocating for better health and a better health care system. I have a feeling I’ll be working on this issue throughout my career. Organizations, health care providers, and advocates all have a role in this work, but the question remains: how do we empower people facing tremendous barriers to feel like they can succeed and the outcomes will be worth the effort? There’s no easy answer, just like there’s no easy way to achieve good health and no easy way to reach the summit of the 14er. But just like I had a group of friends encouraging me to continue my way up Mt. Huron, I’m ready to be part of a support team for patients willing to work toward their own better health. I hope to work alongside many of you as part of that team!